It is with great pleasure that all my team and I welcome you in our white paradise where we make every effort to bring you rest and well-being. Belle Plagne is one of the ten resorts in the Paradiski ® ski area and is one of the most beautiful high altitude villages in the area. At an altitude of 2100 m, in the heart of the Belle Plagne resort and the Paradiski ® domain, this comfortable hotel welcomes you for a departure and return on skis. Discover live and in pictures the resort thanks to the different webcams! Located at the gates of Vanoise National Park, Belle Plagne resort is one of the most beautiful villages in the Paradiski ® ski area (239 runs, 425 km), the 2nd largest ski area in the world! Chic and cosy: such is the atmosphere of this place, where it is nice to meet after a good day on the slopes or in the bustling resort. In the rooms with carefully decorated decoration, in the restaurant with a view of the slopes, on the sunny terrace or in the jacuzzi with a view of Mont Blanc, it is good to land. 144 comfortable or superior rooms, some of which can accommodate people with reduced mobility. The bright and comfortable rooms are equipped with modern facilities, most of which have a view of the slopes. Panoramic restaurant open for lunch and dinner; enjoy our themed buffets and regional specialities. Eat in or take away. Open during the hotel's open season, south-facing terrace snack bar serving lunch and light meals. Enjoy a moment of relaxation by the fire to taste hot wines and cocktails in a convivial and festive atmosphere with the dance floor. Under the snowflakes, in the redness of the setting sun or simply after a day's skiing, is such a pleasure that you quickly become addicted to it. For proof: at the Hôtel Belle-Plagne, those who book one day come back then... every day! « Daddy doesn't know what he's missing! 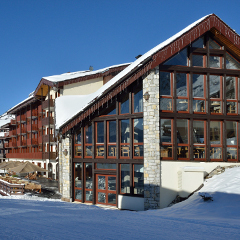 For children, the Piou-Piou club of the ESF de la Plagne 2100 is located 50 m from the hotel. Paradiski ®: 2nd ski area in the world, for all lovers of great and unforgettable ski rides. 425 km of pistes, 3 linked resorts La Plagne - Les Arcs - Peisey - Vallandry, 239 pistes, 2 glaciers equipped, 3 summits at more than 3000 m, the largest bobsleigh track in Europe, ice cascade, 1 run of kilometer launched... Everything for skiing! . Save time! Book your packages with your stay. . Personalized ski equipment rental service. . Ski room. . Departure of ski lessons at 100 m from the hotel. Save time! Book your packages with your stay. Personalized ski equipment rental service. Take the bobsleigh Olympic track! 19 turns, 1500 m of descent: thrills guaranteed. New for 2018: Fatbikes outings and zip line in the resort! It is far from the time when the mountain was limited to the ski slopes! Today, the resorts are teeming with new activities that take place in trees, snow and air. Since this year, El Pro has been organising outings in electric Fat Bike. This oversized tire bike allows you to ride on snowy trails and paths. Each person pilots their aircraft and follows the guide. The outings last 1h30. The fatbike is for everyone, thanks to the electric aid. Just be in good physical condition and be over 13 years old. The other key holiday activity is the Tyrolean waterfall. Several zip lines follow one another between Belle-Plagne and Bellecôte, crossing the valley. In winter, for adults, the activity is open when the slopes close. The waterfall of zip lines is accessible from 10 years old. The course ends with base jump - a jump into the void of an 8 meter high platform! This winter, ski at the feet of our hotel*** Belle Plagne to enjoy a superb snowy massif: La Plagne and its 225 km of slopes, together with the nearby resort of Les Arcs, form the Paradiski ® area, the 2nd largest ski area in the world. There are a total of 425 km of powdery powder to be covered, from where you will contemplate villages and forests around. La Plagne, its villages with its Savoyard charm, its 6 altitude resorts. The local products: the Beaufort "Prince des Gruyères", the charcuterie of Savoie and two specialities specific to the Tarentaise valley: crozets and polenta. 127 slopes covering 225 km, 100 ski lifts and 277 snow canons. Enjoy discounted prices if you book your ski pass, equipment and ESF skiing lessons when you register. An exceptional ski area, with the Vanoise Express cable car linking the two main ski resorts of La Plagne and Les Arcs. 3 summits at an altitude of over 3,000 m.
239 slopes for all levels, at altitudes from 3,250 to 1,200 m.
70% of the Paradiski ® ski area is at an altitude of over 2,000 m, guaranteeing perfect snow conditions throughout the season. Don't forget to try other wintersports activities during your family holiday in the mountains, including bobsleigh (Olympic run), snowboarding, snowmobile, climbing the ice falls, telemark, taxi-bob, mono bob, skibob, snowbodyboarding, snow shoes and dog-sledding. This area has the largest collection of alternative wintersports facilities for extreme sports lovers! Cross-country ski fans will love the 20km of sign-posted slopes and snowshoe lovers can explore the 40 km of Nordic walking. Finally, enjoy the winter entertainment on offer in the evenings, including Savoyard games, biathlon, Chinese lanterns, torch-lit ski descents, shows, last track airboarding and snakegliss. On leaving the motorway: ALBERTVILLE 71 km. When coming from Albertville, take the N90 towards Moutiers, then follow the signs for Bourg St Maurice. Go through the town of Aime and follow the signs for La Plagne Centre. When approaching La Plagne, turn left towards Plagne Bellecôte, then follow Belle Plagne. The resort is a pedestrian area, so drive into the underground car park from ground level, then park near the hotel entrance. AIME BOURG ST MAURICE station 20 km. The hotel is open from December 23th 2017 to April 14th 2018. HALF-BOARD PACKAGE : Accommodation 7 days/7 nights from Saturday to Saturday in half-board (dinner). Tourist tax and drinks not included. Options: Animals admitted: 18€/night - New Year's Eve - Parking - La Plagne lift pass: 6 days including 1 day of free Paradiskiing: 265€ (family rates, children and seniors, please contact us for additional insurance). For single-parent families: children between 2 and 11 years of age benefit from 20% off the adult rate. -10% discount for 4 persons in 2 bedrooms.